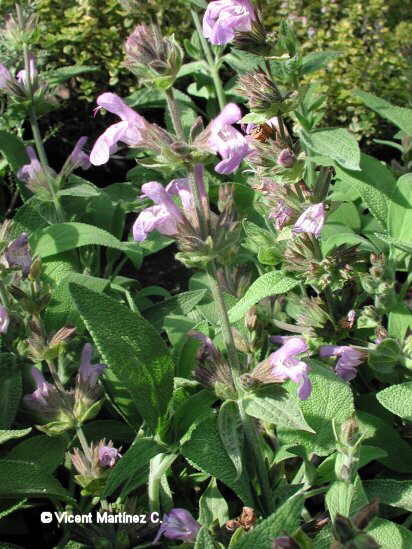 Photo of Salvia officinalis L.
Perennial aromatic plant of the Mint family -Labiatae- up to 70 cm. Erect, pubescent stems. Petiolated leaves, oblong, ovate, seldom lanceolate, well-defined veins. White- purplish flowers, in spikes, with a corolla till 3 cm long and upper lip almost straight. Calyx smaller than the corolla with purple tints. In rocky places and dry grasslands of European Mediterranean Zone. Also cultivated as a medicinal plant.